This page was set up for Netscape and is best viewed using Netscape. When you have finished, please fill in the Feedback form. The Roulettes are the Royal Australian Air Forces' aerobatic team. 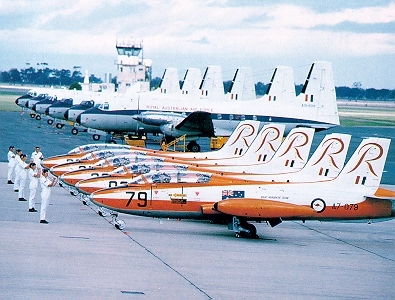 The team was formed in August 1970 and flew their first display in December 1970 at RAAF base East Sale and this display was a prelude to their displays for the 1971 RAAF golden Jubilee celebrations. The first team performed an eight-minute sequence of wingovers, loops and barrel rolls with formation changes such as box, tee, line astern, square and swan. Included in the sequence was a synchronised pairs cross-over, or Roulette manoe uvre which the team adopted as their name. The team is a part of the Central Flying School (C.F.S.) which operates out of RAAF East Sale and is responsible for the training of all of the RAAF's flight instructers. The current team fly the CFS's Pilatas PC-9 which replaced the MB-326H Macchi jet when the Macchi was retired from operations at CFS. This also saw the number of display aircraft increased from five to six. The Roulettes are the third formation aerobatic team to be operated by the CFS, the previous two being the Red Sales, formed in 1962, and the Telstars the following year.All PC-9's operated by CFS are painted in Roulette colors. The PC-9 is also operated by 2FTS at Pearce in Western Australia and other PC-9's have also been recently used to replace the aging Winjeels in the Forward Air Control (FAC) role. The PC9/A is a single-engined, low-wing, tandem two seat aircraft. It is powered by the Pratt and Whitney PT-6 turboprop engine, delivering 950 shaft horse-power. The PC9 has a maximum speed of 570 kph at sea level and with its fuel load of 600 litres, has a range of 1,100 km. The maximum operating altitude of the PC9 is 7,600 metres.All but two of the RAAF's PC9's were built under licence in Australia by Hawker de Havilland. The RAAF currently operates sixty-five of them. A selection of pictures of Roulette PC-9's can be found [HERE] and further down you will find a list of various other aviation links. Due to restricted space on this server I have not included a detailed profile of the PC9. However an excellent profile of the PC9 has already been placed on the internet and can be found [HERE]. The page is part of the RAAF's Official No 2 Flying Training School homepage. All members of the display team are instructors at CFS where they teach other qualified RAAF pilots to instruct. Depending on team requirements, new members are selected from within the CFS staff and undergo a three month work-up programme to reach the standard required for public display. Unlike many other military display teams, the Roulettes are a part-time team and most of the perfomances are completed in the members own time. Roulettes 5 & 6 make up the mirror pair with Roulette 6 flying the lower slot, formating on the inverted aircraft (R5). Roulette 7 flys the spare aircraft and is responsible for providing commentary at airshows. Note: This list is now out of date. A new team list will be added soon. The Roulette planning conference is held at RAAF Williams and it is here that the events that the team will participate in over a six month period is determined. Once the schedual has been finalised, Roulette Leader begins detailed planning for the display, several months before the event. Logistic requests are then compiled and sent to the event coordinator. A few weeks prior to every display, the Roulette Leader writes an administrative instruction that explains timings, flight planning, personnel involved, and the required equipment. The Roulette Leader also briefs all team members on every phase of the exercise including Defence and Air Staff Instructions that detail formation and solo aerobatics, team routine, crowd parameters and the display axis, obstacle clearances, and prev iling weather conditions. The type of show that the Roulettes will present depends on the state of the weather at the event. The HIGH Show is a 15-minute routine for clear conditions. The LOW Show is a 12-minute routine for conditions of low cloud or poor visibility. The Intermediate Show is for moderate weather whereby the display can switch from the HIGH to the LOW show or back if the weather is varible. The HIGH show is mostly presented and includes 18 aerobatics with the pilots flying as close as 3 metres apart while manoeuvring from 500ft-3000ft. As mentioned before, Roulette 7 flys the spare aircraft to the display venue. Once there, he is resposible for providing commentry on the show and also provides public relations support. Each formation position is specialisedand it would be impossible for a reserve pilot to be current for all positions. If a pilot is unable to fly a display, the display will be cancelled. When the Roulettes fly to display venue, a support crew of six RAAF technical personnel on secondment to Airflite East Sale will often travel with the team in the rear seat of the PC9/A. The team usually includes three avionic technicians, two aircraft technicians, and one senior Non-Commisioned Officer (NCO) who provides technical supervision. The ground staff assist in aircraft marshalling, refuelling, and the refilling of oil and crew oxygen. The Roulettes sometimes deploy to small aerodromes in the rural areas of Australia and maintenance facilities at these centres are often scarce so the maintenance personnel acompanying the team provide technical assistance on the aircraft before each display. If a Roulette deployment exceeds several days, a HS748 aircraft from No.32 Squadron, also based at RAAF Base East Sale, or a hercules aircraft from RAAF Base Richmond in N.S.W will accompany the team to provide additional support services for the display. Roulette Macchi's with HS-748 aircraft operated then by The School Of Air Navigation (SAN) but now operated by No.32 Squadron, RAAF Base East Sale. The callsign used is -- Roulettes. Thanks to William Grigs of Adelaide for providing the Roulette team list, display dates, and the Roulettes '84 Macchi picture. Thanks also to Roulette Leader Sqd Ldr Tim Shaw for providing me with the current Roulettes promotional magazine and the Roulettes 25th anniversary magazine. Some great pictures from these mags will soon be displayed here. If you have any information or photographs regarding the Roulettes and you would like to contribute these to this page send me mail at the adress shown above. Australian based, aviation related page with pictures,aviation products, services, and software. 1996 Amberley RAAF Air Show, 4-5 May 1996. Outstanding Aviation realted page with excellent resources. Australian Defence Force links - pointers to official A.D.F homepages. The Unofficial F-111 page. - some good F-111 pictures, RAAF and USAF. Skytech - Australia's first internet aviation supplies store. Australian Aviation Organisations - Very large list of links. Unless stated otherwise, all Roulette pictures scanned, and information obtained from the RAAF Roulettes promotional magazine. This page is NOT an Official page of the Roulettes, the Royal Australian Air Force, or the Australian Defence Force. Back to John's Home Page for some great links, like - FoxFM in Melbourne, Australian Defence Force Links, a link to a TLC page, other pictures (including links to the best Elle pictures you'll ever see, Papua New Guinea related pages, and much much more.